Why do birds have beaks and not teeth? Beijing, China (BBN) – A group of 13 dinosaurs that died in a mud pit in China has yielded an unprecedented discovery. The 154 million-year-old limusaurus had tiny, sharp teeth as a hatchling that it gradually lost as it grew up, according to new research published in the journal Current Biology on Thursday, reports CNN. The finding is a first for the fossil record and may shed light on why birds have beaks and not teeth. The group ranged from babies to adults and showed a pattern of tooth loss over time. The fossilized skeletons were found in mysterious death pits in Xinjiang in the far west of China. “At first we thought they were different dinosaurs — one with teeth and one without and we started to study them separately,” said Wang Shuo, a co-author of the study and an evolutionary biologist at Capital Normal University in Beijing. “But they were largely identical and we found solid evidence that teeth were lost. There were empty tooth sockets in their jaw bones,” he added. The dramatic change in their anatomy suggests that the creatures went from being omnivores — eating both plants and meat (likely insects) to being solely plant-eating herbivores. It’s not an unprecedented phenomenon — the duck-billed platypus plus some fish and amphibians lose their teeth as they mature — but it is very rare and hasn’t been seen in reptiles or dinosaur fossils before, Wang said. DEATH PITS CREATED BY GIANT’S FOOTPRINTS? The ostrich-sized limusaurus was first described by paleontologists in 2008 and was one of nearly two dozen small dinosaur species discovered in three 3.5- to 6.5-foot (1- to 2-meter) deep mud pits in Xinjiang. The animals became mired in the mud, got stuck and died. Research suggests the holes might have been created by the footprints of a huge dinosaur such as the long-necked, 115-foot Mamenchisaurus as it walked over an ash-covered landscape. The large number of limusauruses found allowed researchers to form a complete understanding of its development and dietary changes. James Clark, a co-author on the study and a professor of biology at George Washington University, said that tooth loss may help explain how birds — generally considered to be the living descendants of dinosaurs — developed a beak. “It suggests a mechanism that arrests the development of teeth — an intermediate pathway for the origin of beaks,” he said. The limusaurus also had a distinctive forelimb that may help explain how birds evolved to develop wings. 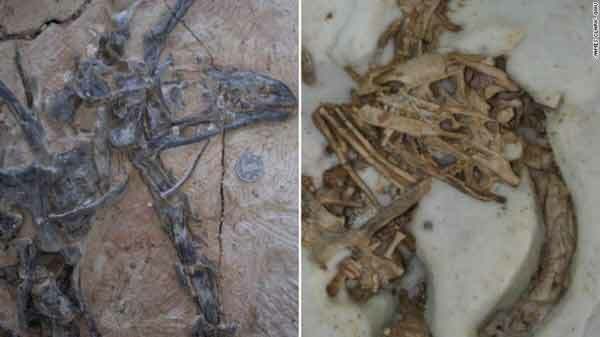 China has been at the forefront of many of the latest dinosaur discoveries, particularly of feathered fossils that have shown a direct link between dinosaurs and birds.